GROW! Who Knew Georgia Farmers Were So Hot! "It's not 'Old McDonald' on the farm anymore"
Is farming the key to happiness? Some Georgia farmers seem to think so. Armed with knowledge, training and a college degree, Georgia's new generation of farmers are self-motivated, analytical, industrious, and eager to succeed. Fed up with corporate America and a broken food system, they found happiness, by leaving the cities to take up an agrarian life. Mostly landless, they borrow, rent or manage farmland in order to fulfill their dreams of doing something meaningful with their lives. GROW! a film by Anthony-Masterson, takes a look at this new generation of sustainable farmers through the eyes, hearts and minds of 20 passionate, idealistic and fiercely independent young growers. In the film they speak of both the joys and the challenges involved in tending the land. 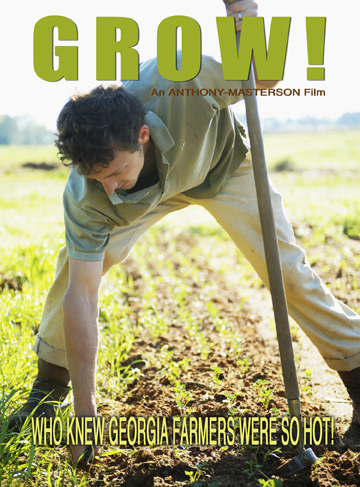 Filmed on 12 farms throughout the state of Georgia during an entire growing season, GROW! provides an honest and inspiring look at this next generation of farmers.